Posted March 20th, 2019 by Deborah Kimmett & filed under Events. this email contains news about the comedy tour + a secret link to the film, Keep Coming Back. We have sold out both our shows, Downward Facing Broad. One is in Sydenham this Friday night at Grace Hall. There are absolutely no tickets. As well as the show on April 4th, taping our CBC radio Comedy Special. No tickets there, either. Why am I telling you this? Well, I wanted to let you know that we have added more dates. I will be coming to Crows Nest Theatre in Toronto this spring, as well as in Peterborough at the Showcase Theatre. We are just firming up dates so stay tuned for both announcements next newsletter. Both are small venues, so please make sure you are subscribed to this newsletter so you don’t miss out on a ticket. In other news, Keep Coming Back will be having its Toronto debut at Canadian Film Festival this Saturday afternoon. This film will be previewed with other films at Scotiabank Theatre. Click here for the link to the festival. This has been a fun process. Brendan Brady aka number one son, wrote, produced and directed this film. Fun Facts: Brendan shot this in one long shot. I played Patty ( Actra Nominated for outstanding role) did a 9 minute monologue and if one mistake was made by yours truly or a crew member, we started over. We did 14 takes and the 14th one was the charm. Please come and see us at Scotiabank Theatre this Saturday afternoon. And if you miss it we will be playing on Air Canada flights starting soon. 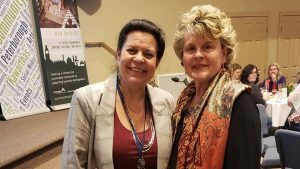 Grateful to have been speaking at International Women’s Day in Peterborough ( seen here with Jeanine Taylor from Kawartha Now. 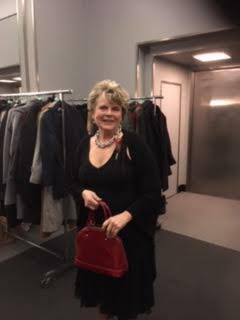 Me at the Actra Awards.